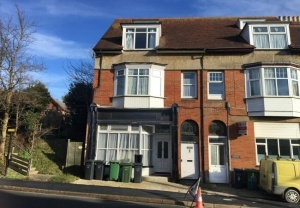 Situated near the south west corner of the Island in the popular town of Totland, this freehold building is currently arranged as five self-contained flats, all of which are let on Assured Shorthold Tenancy Agreements. Flats four and five enjoy separate access at the rear. The property is considered ideal for continued use as an income-producing investment. Entrance hall, living room, kitchen, bedroom and shower room with W.C.
Let on an Assured Shorthold Tenancy Agreement, from 28th September 2017, at a current rental of �0 per calendar month. Living/bedroom, kitchen and shower room with W.C.
Let on an Assured Shorthold Tenancy Agreement at a current rental of �4 per calendar month. Living room, kitchen, two bedrooms and bathroom with W.C.
Let on an Assured Shorthold Tenancy Agreement, from 1st April 2013, at a current rental of �0 per calendar month. Living room, kitchen, bedroom and bathroom with W.C.
Let on an Assured Shorthold Tenancy Agreement, from 10th September 2016, at a current rental of �0 per calendar month. Let on an Assured Shorthold Tenancy from 1st November 2016 at a current rental of �0 per calendar month. Small rear courtyard and parking space. *Guides are provided as an indication of each Seller\'s minimum expectation. They are not necessarily figures at which a property will sell for and may change at any time prior to Auction. Unless stated otherwise, each Lot will be offered subject to a reserve (a figure below which the Auctioneer cannot sell the Lot during the Auction). We expect the reserve will be set within the guide range or no more than 10% above a single figure guide. Please check our website regularly at www.cliveemson.co.uk, or contact us on 01622 608400, in order to stay fully informed with the up-to-date information.